Awareness through Movement & Reading is a 3-part series hosted by the Wellcome Collection in London. Having worked with the Wellcome Collection in the past on Nature Walks: From Parks to Pavements I was invited back to create something for the Reading Room, a hybrid space that is part gallery, part library and part social space. The space was once used for Henry Wellcome’s collection of artworks before becoming the Reading Room. They have recently renovated the room to adjust to a softer, more user-friendly space. In the centre sits a red carpet and comfortable chairs, the space invites people to engage with it through making themselves at home in the space. People are invited to look, read, talk, collect in small groups and, if they wish, tuck themselves into the over-sized pillows lining the stairs. It promotes open access for all and draws both young and old alike. The Events Programme has been running from 2015 in the space and is curated by Valerie Brown, Events Officer of Wellcome. It consists of a series of “pop-up” programmes that encourage dialogue and offer a platform for the expertise of the Wellcome’s audiences. It operates on a spontaneous and chance-discovery approach wherein an announcement is made at the start of the 3-hour open platform that invites people to drop in and out at their leisure. In considering the value of the ‘pop-up’, come-and-go-as-you-please and opting in and out model that the Welcomme Collection’s Reading Room programme assumes, I was reminded of the value of taking time out to rest that is a value in the Feldenkrais Method: Awareness through Movement practice wherein at any time the participant feels strain, pain, disinterest or boredom is encouraged to rest. 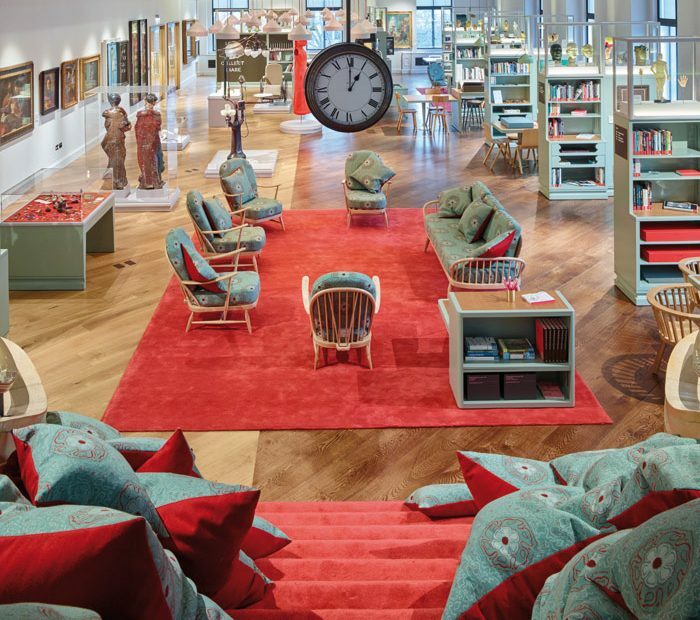 The idea of resting feels like somewhat radical act in the fast-paced speeds of Euston Road, where the Wellcome Collection resides. Inside, a kind of oasis or escape from the city awaits. The Reading Room an even deeper delve into the heart of the place where people can find respite and long durations of focus. As a dance artist used to planned, scheduled and on time events that have a pre-booked audience, this approach has been both exciting and curious for me. Upon the invitation to offer something for the space I considered ways that my work engages quite subtle, poetic gestures that do not aim to disrupt or intervene in a space directly and loudly, but rather, to fold into the space as a collaborative gesture. I consider the actions already in existence in the space, for example – and in the case of the Reading Room at Wellcome – gestures of sitting, standing, lounging, reading, talking and looking. I then ask how those innate movements might “extend” (as a metaphor of the dancer elongating herself, shifting position, making a subtle move outward from her center or “stretching”) beyond (however slight) the everyday and open up what feels like micro-potential for other modes of exchange. These other modes might include reading aloud together, moving as individuals guided in an intimate space. It also might include free-form discourse between a diverse group of people (both regular and more transient visitors) who have – through their spontaneous gesture of responding to the pop-up approach and surprise announcement – gathered together for whatever period of time they deem necessary, appropriate or interesting for themselves. For Awareness through Movement & Reading it felt important to include both moving and reading, two activities already engaged in the space. I wanted, however, to do something slightly outside of the somewhat hermetic-style of reading alone and return to – a more reminiscent (of childhood?) – activity that was both playful and concentrated: of reading aloud and as a group. I also wanted to engage in more individual actions of moving that did not impose a participatory approach. For this project I invited Fiona Wright, dance artist and Feldenkrais practitioner, and one of my teachers over the last couple of years. It was important for me to collaborate with someone who shared my interest in movement and practice-as-research, or whose work engaged questions and reflective approaches. I envisioned us as co-leaders collaborating in the space and to help hold a space in which neither of us knew who or how many might turn up. For this we would aim to be flexible and open; curious and willing. Collaboration is an essential part of my research and production practice as it engages with cultural forms, human interaction and social exchange. I work with a form of a rehearsal which means that I am trying out different modes of creating that can be spontaneous and work with repetition, reflection and trying out ideas and actions in order to more fully comprehend the nature of the work and to listen to the platforms it is asking for. This is all to say that being in the Reading Room at Wellcome collection, collaborating with Fiona, is a generative process that is only now revealing itself and will come into play with my future projects. In reflection, I think my beginning question was: “How do we both structure a 3-hour period of time in order to offer something for a public? And within that structure, “How our practices apply a flexible yet articulated approach within a context left so open-ended?” It has been through the dialogues I have had with Fiona that allowed for, what feels like, an approach that accommodates those concerns. It has, however, left us with intriguing questions of how the museum’s particular approach (their housing of the programme we are a part of) might complicate thinking about artistic practice, public engagement and programming within cultural institutions. As I begin my process of looking back on the series of 3 events Fiona and I recently completed what I recall most were the dialogues around the table we had with three very diverse sets of individuals. From retired medical doctors to students of psychology and a small group of dance researchers and artists, the sharing between readings and moving were, in some way, the most memorable. They were unstructured and spontaneous, growing out of our experiences of reading together and moving. The book chosen for the readings was Proust and the Squid: The Story and Science of the Reading Brain (2007) by cognitive neuroscientist and child development expert Maryanne Wolf. It both celebrates the transformative act of reading whilst suggests a troubled future of reading in our increasingly digital age. From there we invited participants to pull books from the Reading Room shelves, organized by subject areas such as, “Body”, “Breath”, and “Brain”. The dialogues emerging ranged from persona anecdotes and stories to more local and global concerns in our contemporary society. When there was a need to shift we would return to reading or slide our chairs away from the table, stand or lay down whilst Fiona led us through short movement explorations such as gentle shifting forwards and backwards as we sat to both extend and curve our spines, looking in different directions and, at times, getting up for walking as a resting activity. Surprisingly, these somewhat misplaced moves in the context of the Wellcome Collection Reading Room neither disrupted nor got lost in the innate activities of the site. Twice there were young people on their laptops sitting in the corner of the open room we were in and both times they carried on with their activity whilst we did ours. Two very diverse sets of presences cohabitating an intimate space. It was as if our creative, invited and framed 3-hour project slid easily into the fabric of the site’s actions without it intervening or excluding. This feels productive and promising for my work in museums as I aim to move away from obvious forms of engagement that can feel superficial and forced whilst remaining present and offering another way to be in the museum that stretches certain potentials and possibilities in the space. In the combination of the cultural context of the Wellcomme Collection, the thoughtful design and invitation of the Reading Room, the ethos of the programming, approach of the artists and the social chemistry and willingness of the participants that make a bespoke experience. Each time the content of our event shifted within the structure of reading, moving and talking yet the over-arching similarity was the feeling in the room of being together in an easy way that was porous enough for people to enter and exit yet focused enough to bring forward consideration and exchange. It is this environment that I am interested to explore further as I play along the spectrum of being a dance artist reflecting on my practice within and outside of the museum.